Your Bear Cub’s relaxed nature and go-with-the-flow attitude helps him adapt, so you don't have to worry too much about getting the potty training script “just right.” On the other hand, Bear Cubs are so mellow, they may need a prod to use the potty at all. This will require a balance of playfulness, routine, and patience to focus on their progress and keep them moving in the right direction toward full independence. Help your Bear Cub recognize when she needs to go by watching her body language. Some children suddenly hold very still as they eliminate, others begin to wiggle and giggle or dance in their seat. When you see these habits, let your child know, “I notice that you’re doing a little dance … sometimes when kids do that it means they have to pee. Do you think you might have to pee?” At first, the stock answer is usually “No!” Then your Bear Cub may stop dancing for a minute, and start again a few minutes later. Don’t force the issue. Instead, say, “I bet if you try in the potty now, something will come out.” But no pressure. You’re bringing it up to build awareness of her body’s cues, which will help her in the long run. You can also bring out the potty book that you created to reinforce the idea. How does your body feel when it’s time to go? 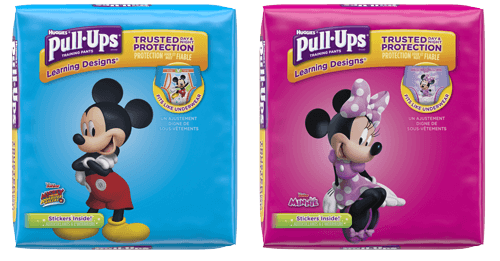 When your child is wearing Pull-Ups® Cool & Learn®, you can ask, “How do your Pull-Ups feel? Remember that if it starts to feel cool, it means you’ve gone pee. We can sit on the potty to see if any poop wants to come out, too, and then we can put on clean, dry Pull-Ups.” Remember that if your child is a girl, it is important for her to learn to wipe from front to back. You might want to skip fussy clothing like tights or overalls at this stage. This will help your child to get onto the potty in time when she's ready. Bear Cubs tend to come running in at the last minute. After a while, you may feel like your Bear Cub is stuck at this stage. He wants to go to the bathroom, but nothing’s coming out. Or, perhaps your Bear Cub gets so involved in playing, she doesn’t notice her Pull-Ups are full. Go ahead and nonchalantly help her when she needs to change her Pull-Ups. Either way, don’t push too hard, because your Bear Cub may respond by becoming even more indifferent about the process. Instead, keep reminding your child what to check for with their Learning Designs® or Cool & Learn® Training Pants. Patience and gentle persistence is the best strategy. Bear Cubs seem to decide suddenly that they’re ready to follow the program after a long plateau. You’ll get there — together.